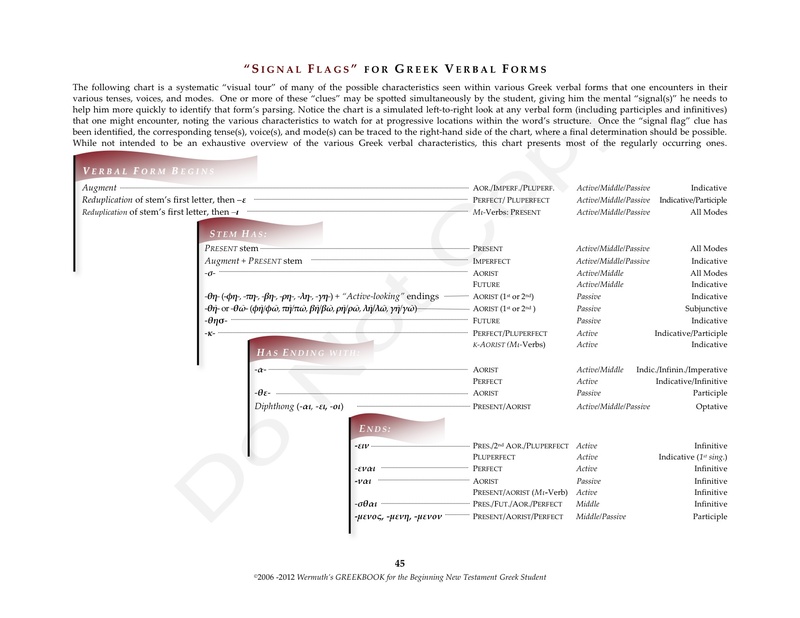 Greek Participles | "It's All Greek to YOU!" 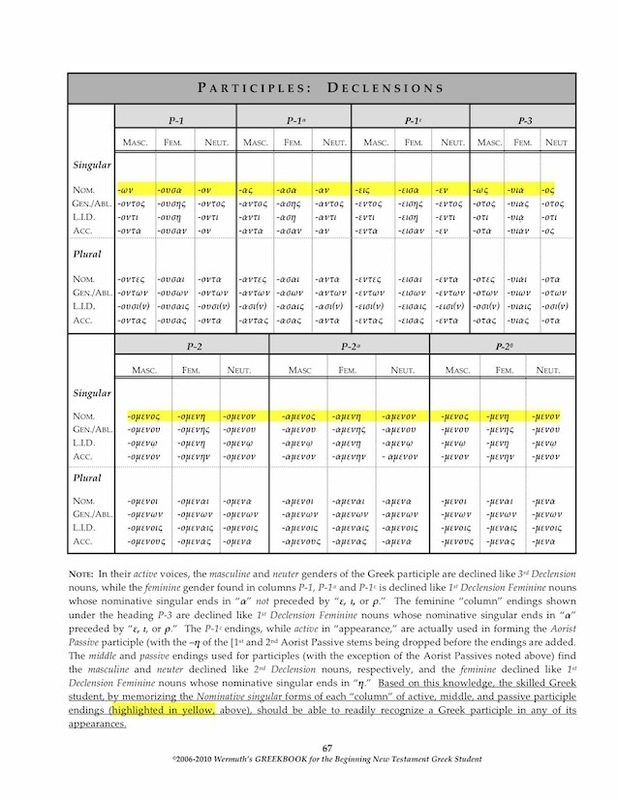 Indicative Mode Greek verbs can be readily learned utilizing a memory system that encapsulates the verb’s personal endings into a numbering system that can be plugged into an easily recognizable and memorable “formula” for each of the Greek verb tenses and voices. 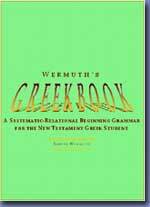 All other Greek verbal modes (as well as Participles, which are verbal-adjectives) can be memorized under similar systems which are included within Wermuth’s GREEKBOOK. Using an “odd” and “even” numbering system which re-codes the verb column numbers with the endings’ thematic vowel, this memory paradigm can be reduced to four basic columns of verb endings that need to be mastered. 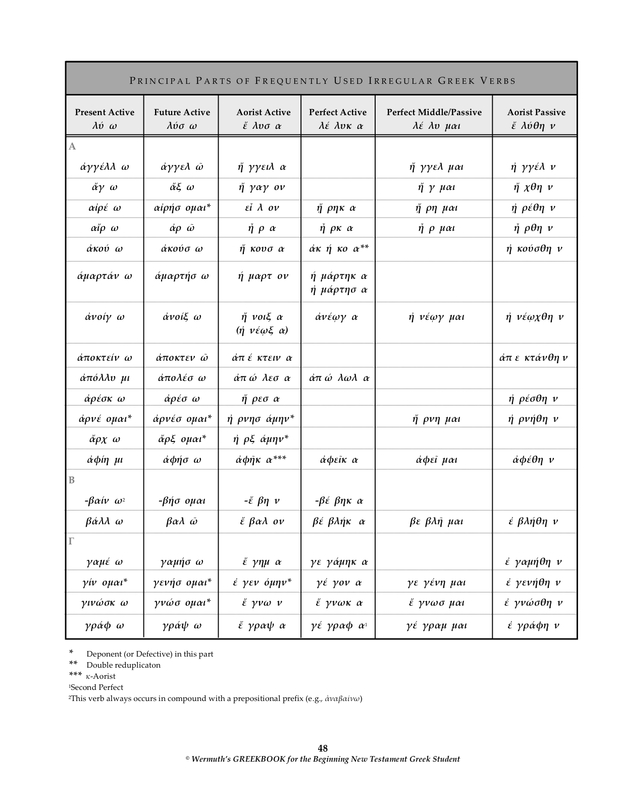 All of the Greek Indicative Mode tenses and their respective voices can be formed off of variations of these four basic columns of verb endings. 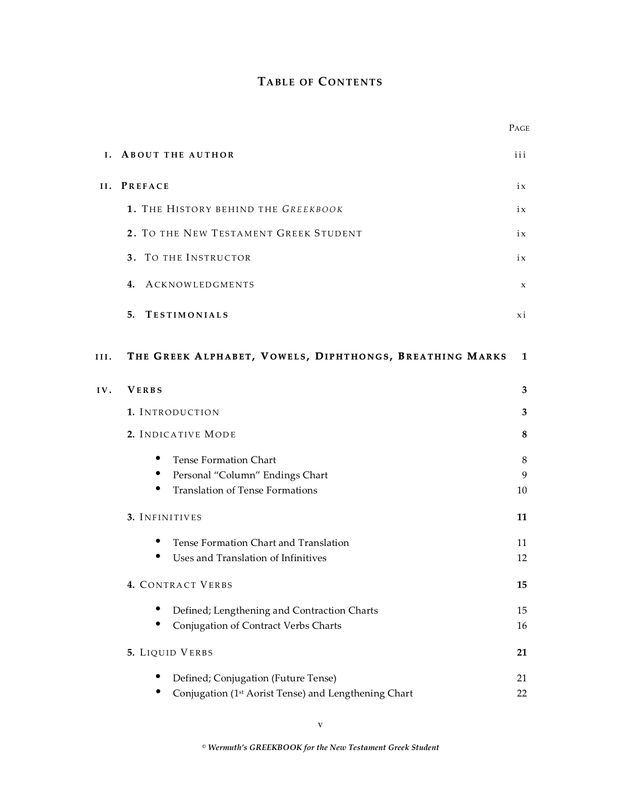 Click here to download the “PowerPoint” presentation. 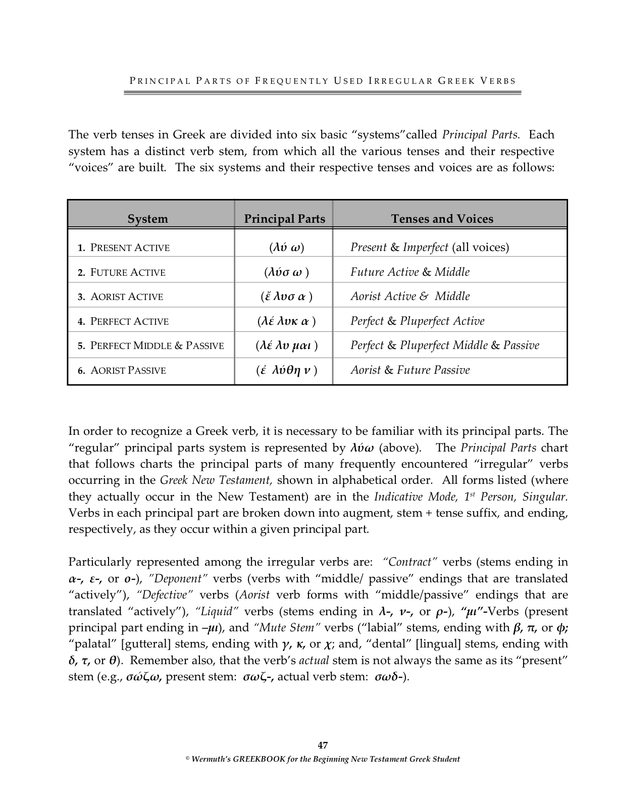 Similar paradigms can be utilized for all Greek modes, including the Subjunctive, Imperative, and Optative Modes, as well as Participles. When you see a Greek word that looks like a verb at its beginning that has declined endings, that word must be a Participle. It is critically important that the beginning Greek student learn the declension of the 3rd Declension noun ἀρχῶν, ὁ (ruler). From this noun active participle endings are derived, and the noun’s stem (ἀρχ-) is replaced with a verbal stem (or, as I like to say in class, “We’re putting Noah back into the ‘ark’ [ἀρχ-] and sending him on a vacation.” The resultant verb stem + declined endings = a verbal-adjective, the grammatical description for a participle (e.g., λύων, λύοντος…). 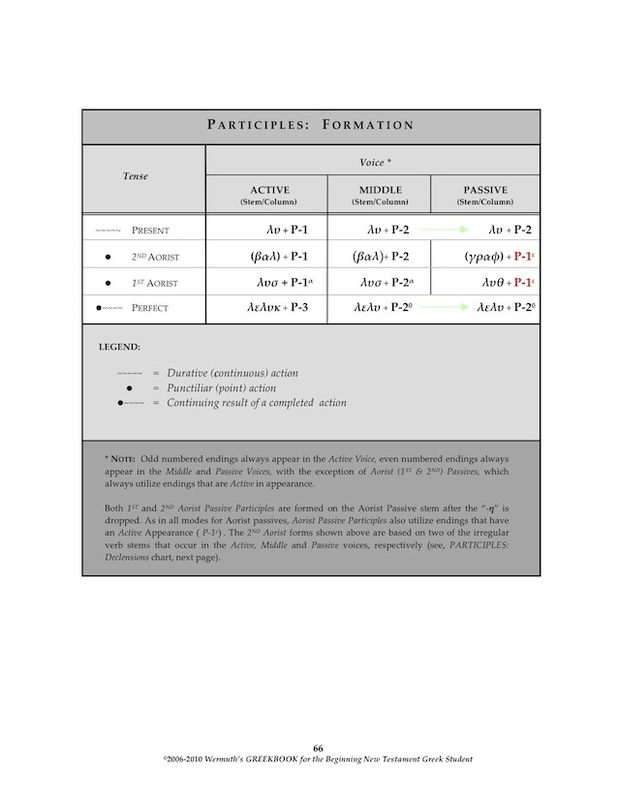 When studying and memorizing participle endings, it is helpful to remember the nominative singular forms of each of the active, middle and passive endings that occur. 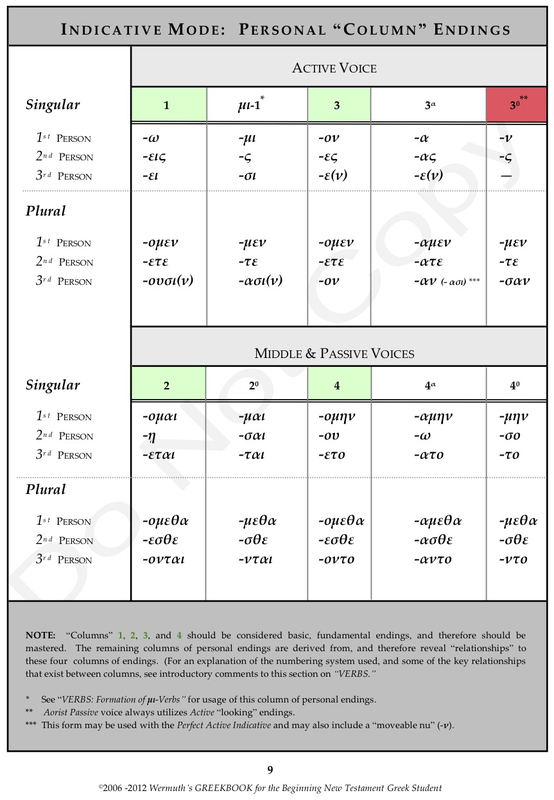 Including thematic vowel changes, there are four active forms of participle endings (one of them used “passively” with Aorist passives) and three middle/passive forms. Since participles are verbal adjectives, the student will observe a verbal stem with declined endings in all three genders. 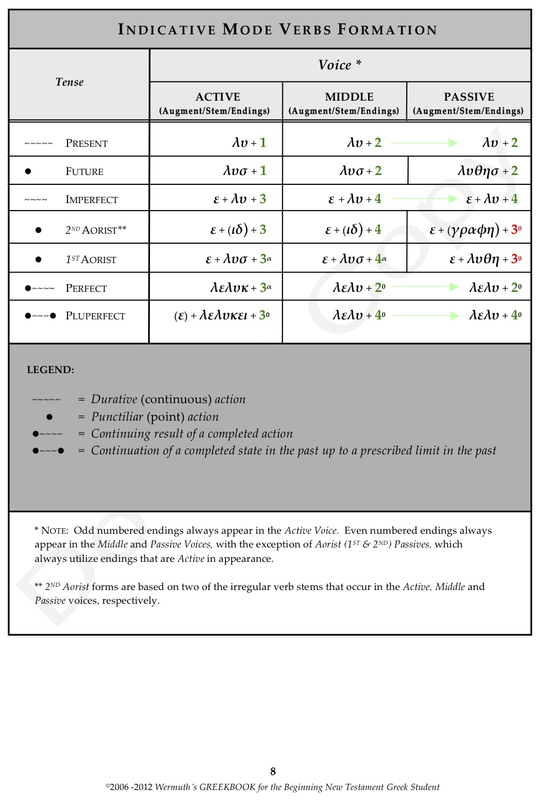 The active endings (nominative singular) are represented by: -ων, -ουσα, -ον (Present, 2nd Aorist); -ας, -ασα, -αν (1st Aorist); -εις, -εισα, -εν (1st & 2nd Aorist passive; remember: Aorist Passives always utilize “active looking” endings); and -ως, -υια, -ος (Perfect). Since each of these groups of endings are declined in a similar way with the masculines and neuters in the 3rd declension and the feminines in the 1st declension (like γλῶσσα), knowledge of the nominative singulars becomes a “jumping off” point in the student’s mind for recognition of any other case forms he may encounter. 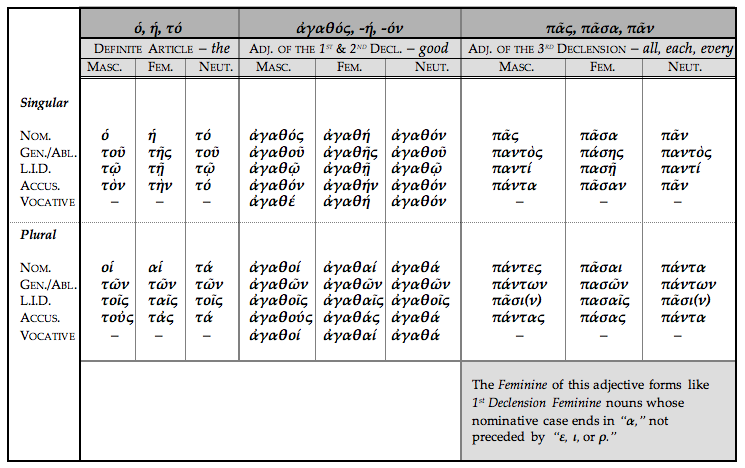 The middle/passive endings are much more simple, occuring in the 2nd declension for masculine and neuter forms, and the 1st declension for the feminines (like ἀγάπη) and represented by; -ομενος, –ομενη, –ομενον (Present, 2nd Aorist); -αμενος, -αμενη, -αμενον (1st Aorist); –μενος, -μενη, -μενον (Perfect). 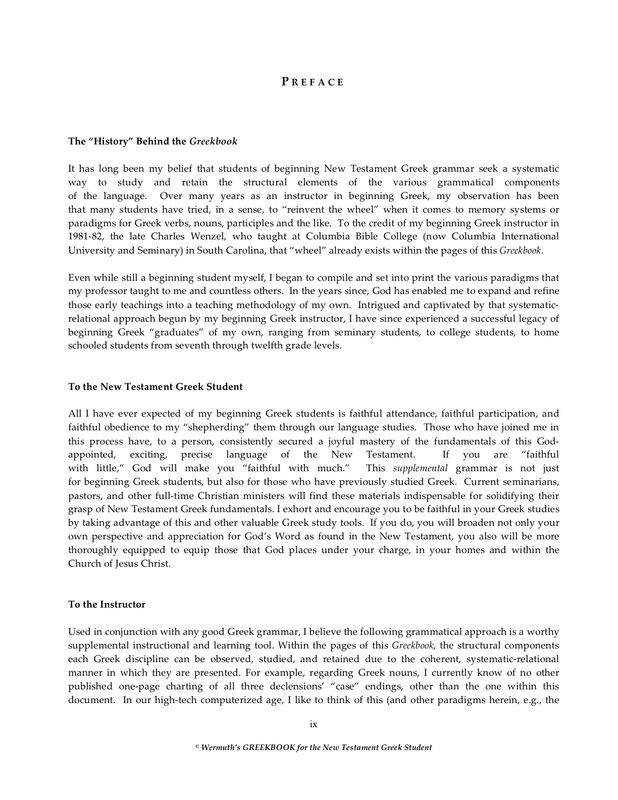 When the Greek “circumstantial” (temporal, adverbial) participle occurs (without an article) in the Present tense. 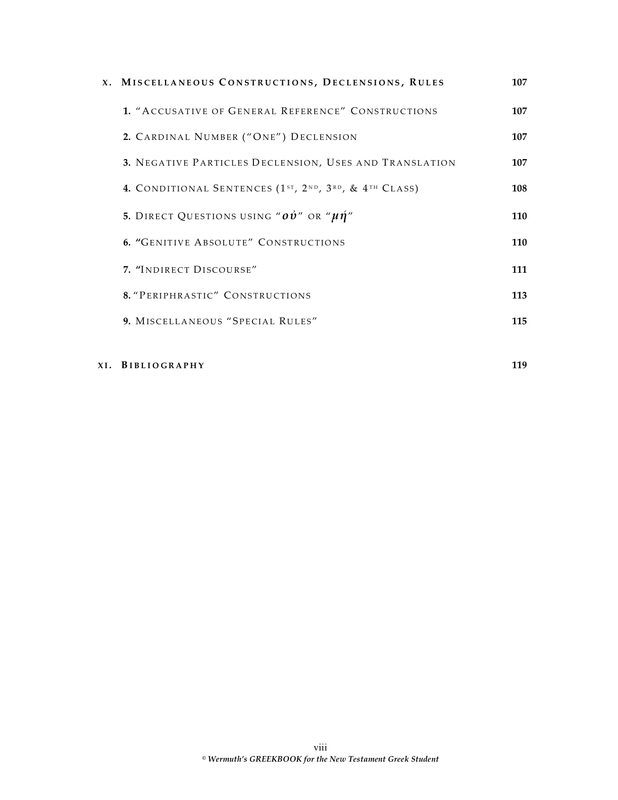 The “temporal” (time-oriented) adverb used to translate a Present tense circumstantial participle is “As” (or “While”). 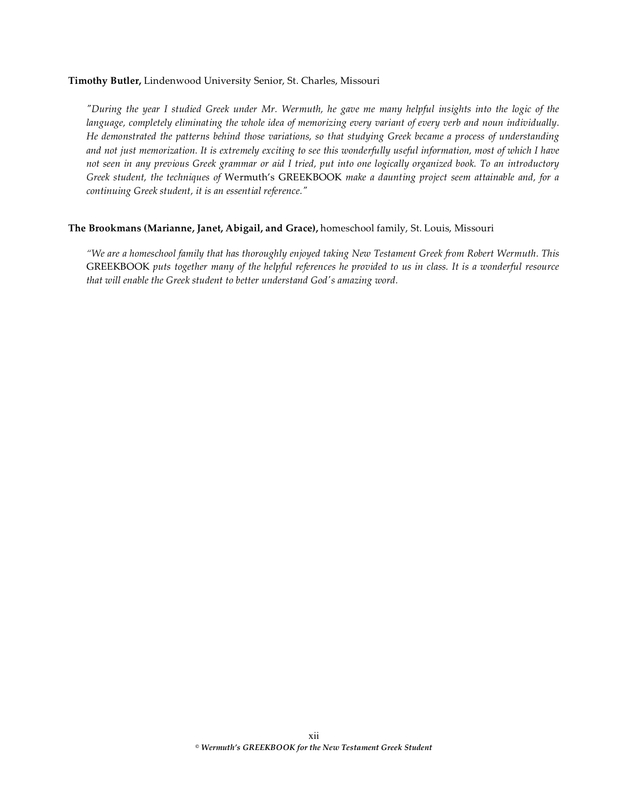 The time frame of the “dependent” (temporal, circumstantial) clause should be consistent with the time frame of the indicative verb of the “independent” (main) clause. (AORIST) ἐλθῶν οὖν ὁ Ἰησους εὖρεν αὐτὸν. Participles are verbal adjectives. Being part verb, they have tense, voice and mode, while being part adjective, they also have (as do nouns and adjectives) gender, case, and number. 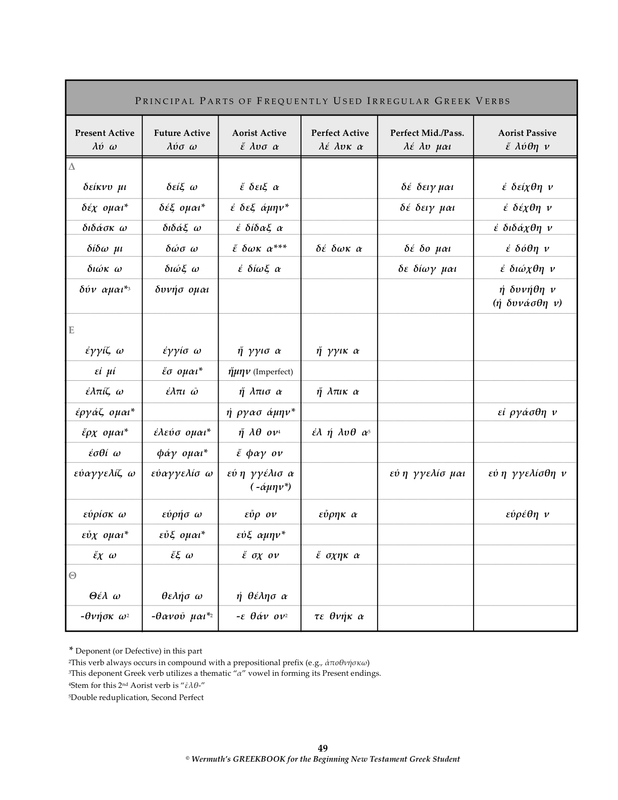 As a result, the parsing of participles is represented through all six of these distinctions: tense, voice, mode, gender, case, and number (e.g., λύων ‒ Present, Active, Participle, Masculine, Nominative, Singular). Participles may be used “adjectivally” including as a substantive, when no antecedent noun is present. 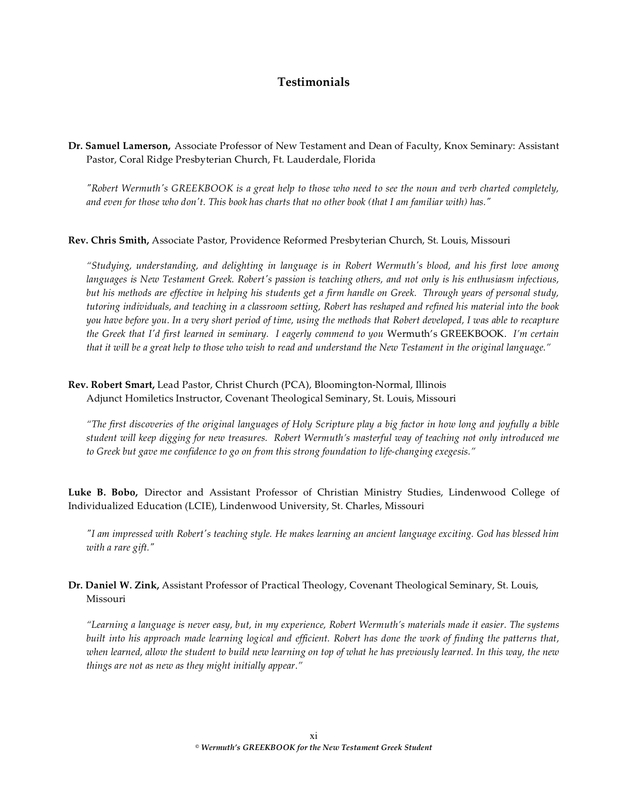 In these instances, as with all adjectives, they agree in gender, case, and number with the nouns or pronouns they modify. Used “adverbially,” participles may receive adverbial modifiers, and may take a direct object. Participles are declined in all three genders: masculine, feminine, and neuter. The masculine active participle is declined like the 3rd Declension masculine, lingual mute stem noun, ἄρχων. 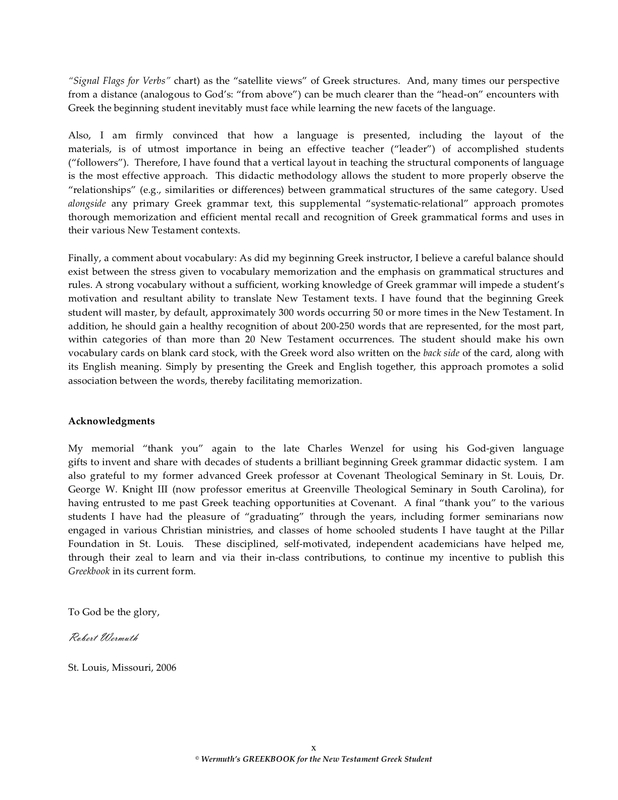 * The feminine active participle is declined like the 1st Declension feminine noun, γλῶσσα (whose nominative singular ends in –α, and is not preceded by ε, ι, or ρ). 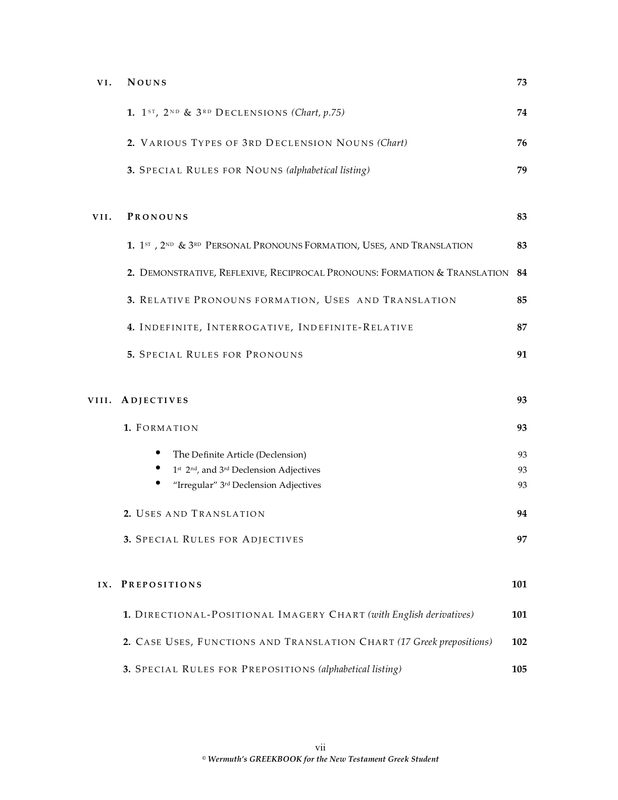 The neuter active participle is declined like 3rd Declension neuter nouns whose stems end in –ματ. 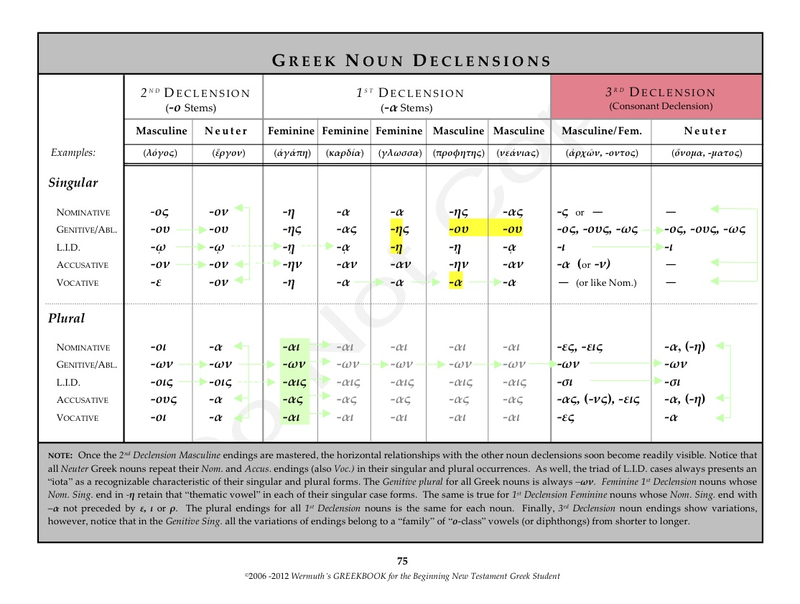 The middle and passive participle endings are declined like 2nd Declension masculines and neuters; the feminine is declined like 1st Declension feminine nouns whose nominative singular ends in -η. Remember Aorist Passive participles always use endings that are active in “appearance.” To get a more comprehensive “satellite view” of Greek Participles formation, click on each of the images, below. 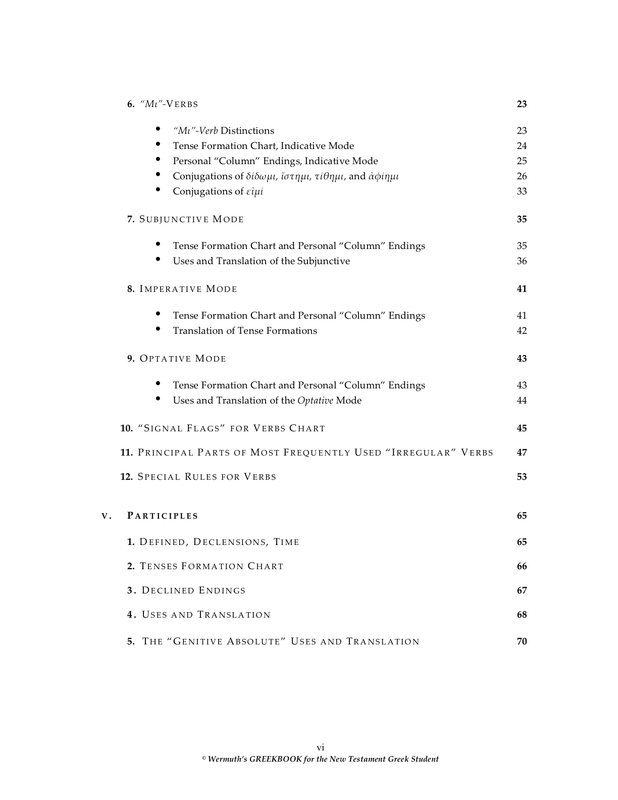 In circumstantial (temporal, adverbial) clauses, the time frame of the participle in translation is related to the tense and time frame of the leading (Indicative) verb. The Present participle is found where the action of the participle is represented as taking place at the same time as the action of the leading (Indicative) verb, regardless of when the action of the leading verb takes place. The action of the Aorist and Perfect participles denote action that has occurred prior to the action denoted by the leading (Indicative) verb, regardless of whether the action of the leading verb is represented as occurring in the past, present, or future. 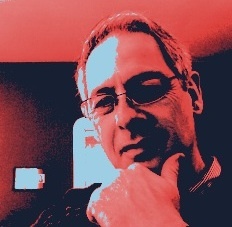 For more on translation of participles, both “Circumstantial” (temporal, adverbial) participles (i.e., those without a definite article), as well as “Articular” (adjectival) participles, see the post, “Participle = Verbal Adjective.” (Also see: Wermuth’s GREEKBOOK (pp. 68-69). 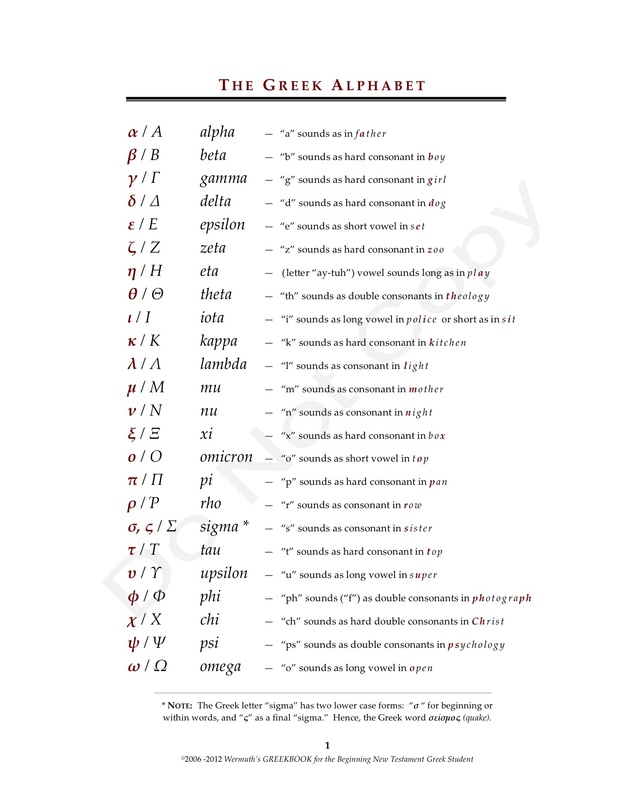 *NOTE: It is imperative that the beginning Greek student learn the declension of the 3rd Declension noun ἀρχῶν, ὁ (ruler). From this noun Present “active” participle endings are derived, and the noun’s stem (ἀρχ-) is replaced with a verbal stem (or, as I like to say in class, “We’re putting Noah back into the ‘ark’ [ἀρχ–] and sending him on a vacation.” The resultant verb stem + declined endings = a verbal-adjective, the grammatical description for a participle (e.g., λύων, λύοντος…).